This year we had 4 competition winners, 2 UK and 2 Global. 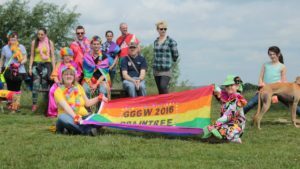 In both the UK and globally 1 prize was for an entire walk location, as well as an individual winner. 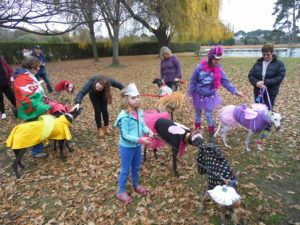 The entire walk winner received a donation to the sighthound charity of their choice. 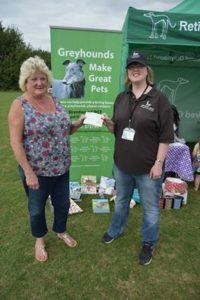 The picture below is Charlotte Corsham handing over the donation cheque to Joy Hardy from Ashwells Kennels (Brentwood Retired Greyhound Trust). Charlotte was the organiser of the walk held at Geat Notley Country Park in Braintree. 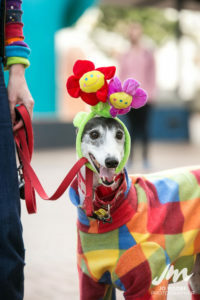 The global winning location was Christchurch, New Zealand and Karen Wicks chose Greyhounds as Pets, New Zealand to receive her prize donation. I am awaiting a picture for the UK individual winner but will add that asap. The global individual winner was Fleur owned by Nathalie Lecaude and the picture below is Fleur with all her goodies and in her fabulous carnival costume. I think you’ll all agree that Fleur and Nathalie really did enter into the carnival spirit. 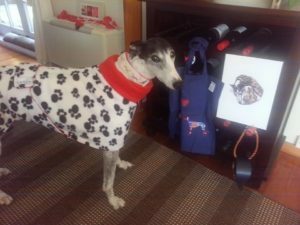 We were very lucky to have some fantastic prizes donated including various collars, fleece coat, print, blanket and a tote bag. There has been a slight delay getting the pictures as most of the prizes were made to the winners specifications.